I'm so excited for you, with all your trees. My orchard is still in pots and will be for some years yet, I fear. Plan B's and Plan C's have all come into play at times. It's good to have the back-ups. Good idea about the french drain. They do a good job. We put one in all around the house foundation, just in case, when we built. Ditto on the French drain. We had a drainage problem in our backyard. When we got our patio installed they put a French drain under it and it resolved the problem. 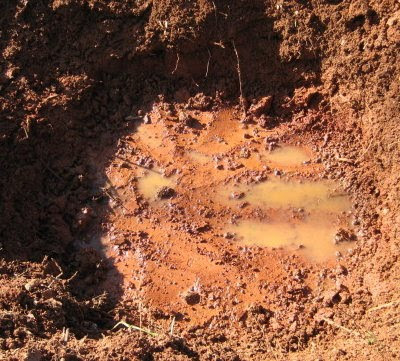 If I dig in our rocky NH soil, I'd have a hole with large and small rocks in it - not water!! Geodyne I do have a dwarf lemon tree in a pot, which will have to stay there forever because our winters get too cold. The plan is a greenhouse for it, eventually! Theresa, one thing I've discovered about owing an old home is that the plans are everchanging *lol. It seems like the longer we wait on things, the more the plans change. I just hope there aren't anymore drastic surprises like this one was. Sue, I know how it is with those rocks! When I lived in Arkansas, we used to lament that there wasn't a market for them. We put French drains around the previous house we lived in (rented actually) and they made a wonderful difference when the flooding rains came. Dan plans to do the same to this house, even though it has naturally good drainage. The garden was a surprise in terms of drainage, but at least there are solutions. Bettina, interesting comment. I have discovered that about plants too, that some locations make them "happy," some they just don't thrive in. It's a concern with large plants like trees, because they are so difficult to move. I'm planning a Mediterranean herb garden in one of those beds in front of the house. I do plan to incorporate a lot of sand into it. Hopefully the will do okay with our winters. I just can't believe you are still planting when we just keep getting snow storm after snow storm. Julie, I think we're getting your snow as rain. We've had a couple forecasts for sleet and snow but it's always a tad too warm for that by the time it arrives. Instead we get rain and the bone-chilling cold that comes with the humidity rain brings. I don't know of anyone who hasn't used Plan B. For us not to many things go right the first time so we're sort of used to Plan B.
I love your zig zag fence. I would love to have one of those around our property. Yep, plan B - my raised composted beds. When the original garden space proved to be unsuitable for tomatoes, beans and a few other plants, we decided on a new garden space. That turned into the Stott Lasagna garden experiment, which was done in raised beds. Now I'm wondering if I knock the two humps to fill in the gap, will I get more useable garden space that way? That would be plan C! 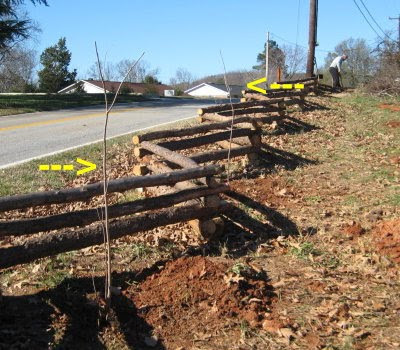 Barb, thanks for liking the zig zag fence. We almost always seem to favor that "rustic" look. I think you're right about plans. That's probably why it's good to think through alternatives beforehand. This was one of those things we hadn't expected, but at least we had another spot picked out! Nina, your plan C sounds like a winner! I love the idea of raised bed gardening (and the lasagna technique) but we haven't made one raised bed yet. Yep, plan B. Know all about it. Latest plan B was a redesign of our hoop house, while it stood, while it was collapsing. Those trees look soooo good! Good luck with the water problem. Maybe a swale would help? Not plan B!!!! Lol, yeah things seem to change a lot around here too. I hate those two little words I've heard Lee say a few times (oh crap) because it means we have to change our plans. I think we are on plan P on our bathroom with more letters to go. 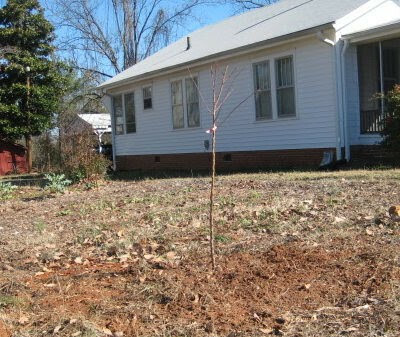 I still have more fruit trees and bushes that I want to get in the next couple of years. 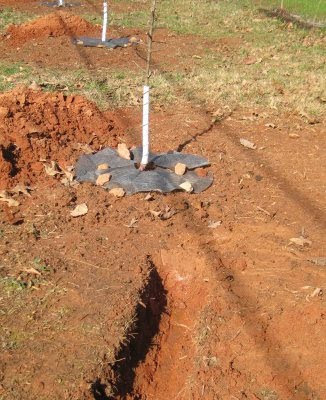 We will have to see how many of our newly planted trees come back next year. Hopefully all of them. I was very tired of lugging the buckets of water to them by the end of the summer. How wonderful to get some fruit trees going, I miss all my old ones. Won't it be great to have Elderberries right there in your own yard!